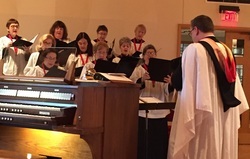 The Music Ministry is comprised of a large group of volunteers whose mission and purpose is to facilitate, enhance, and lead worship at Saint Timothy’s through music and liturgy. It is important to note that the Ministry has been a significant part of parish life since the church was founded and continues to help define our spiritual and community ethos week after week and month after month. The Ministry seeks not to perform music, but to worship and lead in worship through music! The Music Ministry is large, spiritually aware, diverse, inclusive, and multi-generational. All of which is reflective of the mission of Saint Timothy Parish. The Office of Evensong is sung at the close of each day in cathedrals, collegiate chapels, monastic communities, and parish churches throughout the Anglican Communion. Derived from the ancient offices of Vespers and Compline, it is a service of rare beauty offered through the singing of psalms and canticles, the reading of scripture, and prayer. This liturgy of sung prayer has been offered daily throughout the Christian era and it enables us to join with all those who have gone before, those today who offer their evening prayers, and those who will continue their sung praise, petitions, and thanksgivings in times to come. The worshipper offers praise through association with the Choir and sits awash in sung prayer as it resonates throughout the sacred space. Natural time is suspended as word and music combine to capture the holy rhythms of the spheres and the worshipper is transported beyond chronological time to a place where creation and eternity coalesce into one. Under the leadership of a professional Director of Music, Mr. Mark R. Scholtz , (who is also the Organist) we have approximately 60 volunteer musicians in our six choirs and ensembles. 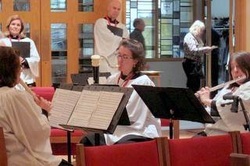 Many of them participate regularly in our liturgies as both vocal and instrumental soloists and Cantors as well. Four of the six choirs/ensembles have Volunteer Directors who assist the Director of Music by providing leadership in their areas of musical expertise. ​Our 25-member volunteer Choir provides musical leadership at the principal liturgy each week from September through June, and on all major festivals and special celebrations. In addition, the Choir sings Choral Evensong several times each year, including All Saints, our Patronal Feast (January), Mid-Lent, and Trinity Sunday. The Choir rehearses every Thursday evening, September through the beginning of June, from 7:30-9:00 p.m. in the Choir Room. ​Under the leadership of volunteer director, Rick Sharp, the Saint Timothy Brass adds a triumphant note to our worship for festivals. They often accompany the Choir on the Offertory Anthem. ​This group of fourteen high school and adult volunteers participates in worship regularly both by themselves and as accompanists to our various choirs and instrumentalists. In addition, our three plus octaves of hand bells are used in multiple ways to add creativity to our liturgical expressions. Georgia O’Brien is the volunteer director who works with this ministry. The Saint Timothy Recorder Consort This is a unique group of musicians which participates in worship several times during the course of the musical season. The musicians play various styles of early music and consistently provide a wonderful and fresh musical dimension to the worship life of Saint Timothy’s. St. Timothy’s is fortunate to have a significant number of skilled instrumentalists and vocalists who sing or play in worship as soloists or accompanists as well. ​This is a group that typically meets on the 1st Saturday of each month from 10:00-11:00 a.m. to play and sing songs used for Family Worship, as well as other songs of interest. Anyone is welcome to join us for the rehearsal (with no obligation to play on Sunday). Varied instruments and singers would be welcome; we've had banjo, concertina, violin and would love to have winds, reeds, mandolin, or other ideas. Our songs are typically simple and would be a great way for someone who only knows a few chords to practice and learn more. Schantz Pipe Organ—Built and installed in 2004 by the Schantz Organ Company. The organ has 11 ranks and was specifically designed for this worship space. The organ loft was built for this organ as well. The organ was principally designed to accompany congregational singing. Yamaha C3 Concert Grand Piano —10 years old. Located in the Worship Space. Mid-sized Baldwin Grand Piano—30+ years old. Located in the Chapel/Choir Room. Kimball/Studio Upright Piano—20 years old. Located in the Parish Hall. Small Spinet Rehearsal Piano—35 years old. Located in the Director of Music’s Office.